Zeljko Mitrovic born in 1967 in Zemun, Belgrade, an excellent musician, music and TV producer and businessman, is the CEO and founder of the Pink Media Group, the biggest media company in the region. He is also a member of the Serbian Group of the Trilateral Commission. Zeljko started in the late 80’s with a recording studio, then opened a radio station in 1993 which was followed in 1994 by a TV station, TV Pink, soon the most popular commercial TV in the country. Zeljko founded the music publishing house CITY Records which today boasts of millions CDs sold and 500 performers under its label. 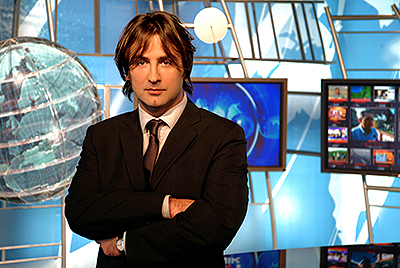 After launching his satellite program, Zeljko in 2002 launched TV Pink Montenegro and a year later Pink BiH, in Bosnia-Herzegovina, the only truly pan-entity station. Today, Zeljko also owns another 43 channels broadcast in the networks of the biggest cable operators in Serbia, Montenegro and BiH. By the end of 2014, he will round up his program with 60 channels of various profiles like music, 10 blockbuster channels, educational, fashion etc. Zeljko then included into PINK INTERNATIONAL COMPANY a subsidiary, the PFI - PINK FILMS INTERNATIONAL – a unique film production complex catering to the most exacting producers of blockbusters and TV shows. In 2004 Zeljko bought a business jet airline which today operates six planes. Zeljko is also a philanthropist and financially supports the needy and orphaned. In his teen years, Zeljko founded a popular band Oktobar 1864 as one of the most talented base guitar players of his generation. He has now formed another one, “Berklee Groove”, which has released so far four singles and an album is in the making. Happily married, father of four.